Early wake up in the morning, by four wheel drive ( private ) going up to mt.Pananjakan to see the sunrise. while you are waiting for the sunrise, you could have a cup of LocaL coffee there. After sunrise, back to fourwheel drive, and drive back down through sea of sand, stop at parking area and start to walk to mount Bromo ( on foot or ride a horse ), to reach the rim of mount Bromo, you will walking up trough 250stairs. After volcano tour, back to hotel for having breakfast and shower. 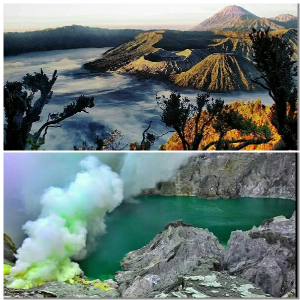 Check out, then you will be proceed to next choosen hotel near mount.Ijen. Check in and free program. Morning wake up call, start the journey accompanied by our guide to start point. On the way to starting point, you will passing trough coffee and cloves plantations. Then start walking up about 3 km to reah the rim of mount.Ijen. Here, you will meet strong sulfurminer who carry about 60 up to 100 Kg of Sulfur stone. After volcano journey, then you will be transfered to Ketapang Harbour ( Banyuwangi ) passing trough tropical rain forest. From Ketapang harbor, you could cacth your next trip to Bali island by ferry . end of service. This package is a private service, more comfortable then a shared one. # shared / open trip is a shared trip with others guest. The driver will pick up the others guest at the others places, and it will takes time. Your trip will become longer, more tired.